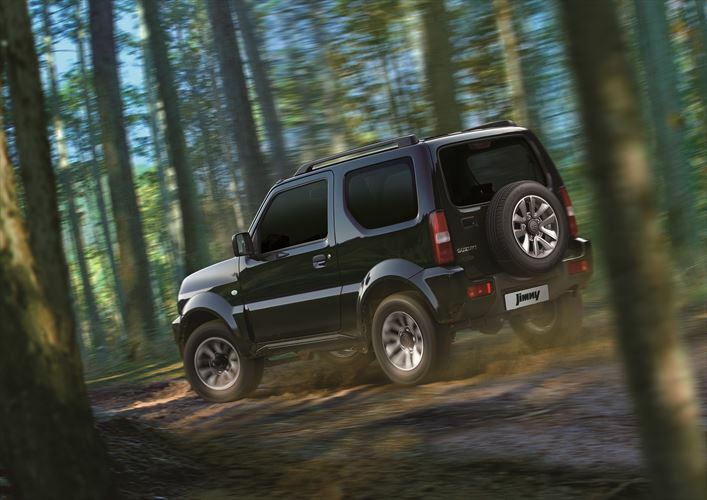 Suzuki has updated the Jimny with changes and upgrades to both the exterior and interior, while an equipment upgrade has also been introduced. An automatic transmission is being offered as an alternative to the manual gearbox for the first time. Changes include the fitment of new 15-inch alloy wheels, boasting a dark silver finish and two new colours: Bison Brown, and Khaki Pearl Metallic. The cabin has also been spruced up, with an all-new instrument cluster the primary feature. The cluster features main dials for speed and rev count, with a third, intersecting instrument hosting a digital display. The display includes fuel tank level and engine temperature readouts, as well as a digital clock, ambient temperature display, gear and transfer case indicator, a fuel economy readout, and a trip meter. The Jimny’s interior features upgraded seat upholstery aimed at boosting both comfort and durability, while a new steering wheel design has also been introduced. The introduction of a four-speed automatic transmission option for the Jimny will please owners seeking the convenience of clutchless operation, especially in urban traffic conditions, while also making access to the Jimny’s legendary off-road capability even easier. As with the manual gearbox version, the automatic transmission is still partnered by a transfer case offering low-range operation. The Jimny is still powered by a lively and economical 1 328 cc four-cylinder engine, with a maximum power output of 63 kW at 6 000 r/min, linked to a torque peak of 110 Nm at 4 100 r/min. Equipment includes remote central locking, a CD receiver sound system, electric windows and air-conditioning. Safety features include dual front airbags, head restraints, inertia reel seatbelts, and ABS anti-lock brakes. Both the manual and automatic transmission-equipped versions of the Jimny are covered by a three-year/100 000 km warranty, as well as a four-year/60 000 km service plan. This entry was posted in News and tagged 4x4, automatic, AWD, Jimny, Suzuki. Bookmark the permalink.